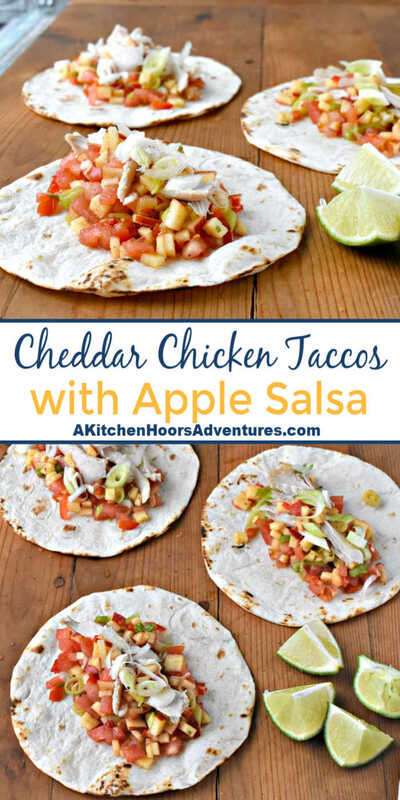 Sweet and spicy apple salsa is the star in these Cheddar Chicken Tacos with Apple Salsa. You can grill chicken or use leftover roasted chicken for the tacos but make sure you get a SHARP Cheddar cheese to complement the sweet and spicy salsa. This post is sponsored in conjunction with AppleWeek. I received product samples from sponsor companies to aid in the creation of the AppleWeek recipes. All opinions are mine alone. I have been thoroughly enjoying #AppleWeek. Haven’t you? There have been so many delicious recipes shared already this week. And there’s plenty more still to come. We have so many sponsors this year, we extended it two days running from Sunday to Saturday. That sort of messed me up in the beginning but I am back on track! I know I’ve talked about how I’m not a huge sweet and savory fan. You will rarely if ever see pork chops and apples or applesauce on the dinner menu. However, there are a few experimental exceptions to the rule. It all started with this sweet and spice mango guacamole, you see. It was my truly first recipe venturing into this sweet and savory combination in my recipes. It worked out so well, that I made a kiwi version, too. Then I made this delicious grilled fish topped with strawberry salsa. That was totally the hubs’ idea and I’m glad he had it, too. It was AH-mazing! So, I’m warming up to the idea of the sweet and savory together. This summer I grilled up some pork for tacos and serve them with a peach salsa. Holy wow was that delicious! I don’t think I shared it, though. I’ll have to see if I can find those pictures, but I know I don’t have the recipe. Might have to try that one again and share with y’all. This lead to me making these chicken tacos with apple salsa. You see, I didn’t want to stick the traditional sweets and or breakfast items with the apples. I’ve done quite a few of those in the years I’ve participated in #AppleWeek. Two. It’s been two years that I’ve participated in this event. And that, dear readers, is how I decided to make these chicken tacos with apple salsa. Originally, I grilled chicken thighs but we totally devoured those and there wasn’t any left for the photo shoot. Oh well! Guess I’ll have to make them again. Twist my arm. Ow. Except this time, I decided to use left-over roasted chicken for the tacos and focus mainly on the salsa. Oh my word is that good salsa! It’s got a kick from the jalapenos, the sweet crunch from the apples, and the bite from the onions. Add in some herbs and spices and you’ve got a delicious salsa to serve up for game day eats or tailgating. Because, well, it is that time of year isn’t it? 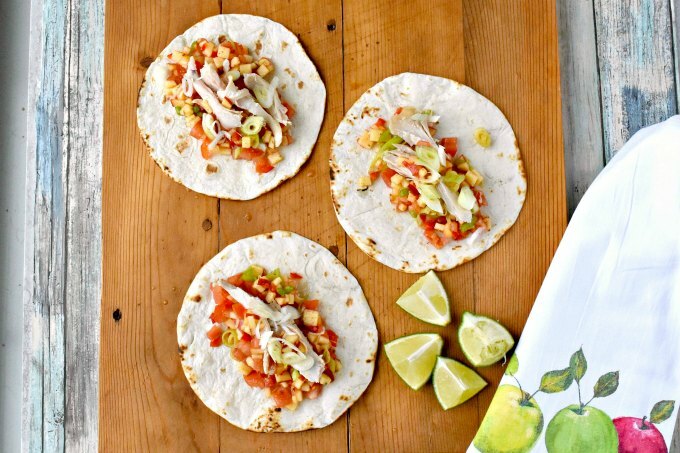 These chicken tacos with apple salsa would be deliciously different than the standard tacos, Buffalo chicken wings, or nachos. Oooooh! Turn these into nachos. Now there’s an idea. You see how that happens? My mind just jumps to ideas like that. I wanted to focus on the salsa because it’s made with Envy Apples. They are only THE BEST apples. They crossed a Braeburn with a Royal Gala for a superior apple that has amazing crunch and flavor. And it has staying power without all that waxy coating that other apples get. Let me explain. There’s something special about their apples. They’re perfectly crisp and sweet right off the tree. And, even though they’re irresistible at that moment, they mellow in flavor over time almost like aging a fine wine. Unlike other apples that just, well, are over ripe in a few days, my Envy apples have lasted in my fridge for a while now. Instead of getting mealy like other apples, they’re still crisp as day one and have a mellow, sweet flavor that’s perfect for nibbling on during the day. Oh yeah, they don’t brown as quickly as other apples. You read that right. It doesn’t brown as quickly as other apples due to the vitamin C content. The high vitamin C content keeps it crisp longer, too. Making for an apple that is sweet and delicious well after those *ahem* OTHER apples. Confession. DO NOT TRY THIS AT HOME. I had one cut in half on my cutting board for about a week. I wouldn’t recommend this and I totally did not eat it, but it wasn’t even the slightest tint of brown. If I had done that with another store apple it would have disintegrated when I tried to pick it up. Just sayin. If that doesn’t convince you to look for Envy Apples in your area, then I don’t what will. Besides my delicious cheddar chicken tacos with apple salsa. Just look at all that color, crunch, and flavor. And they come together in no time if you use left-over roasted chicken. Even grilling up some breasts doesn’t take up much time either. You could easily have this on the table in under 30. Which is a good thing because your friends and family will want you to make this often. And, you can make it ahead of time and not worry about the apples getting all brown and gross. Win win! Don’t forget to enter the giveaway! Get a head start and follow Envy Apples on Facebook, Twitter, Instagram, and Pinterest. Combine the apples with the next six ingredients (jalapenos through cumin). Refrigerate until ready to serve the tacos. 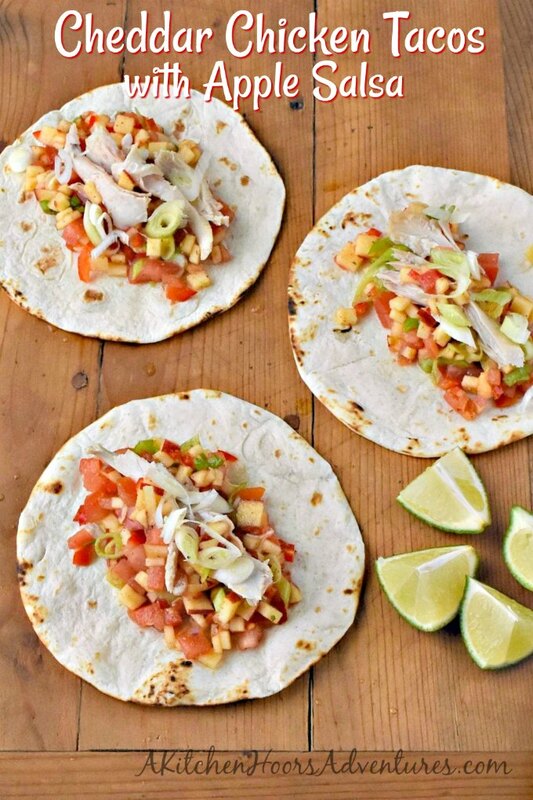 Top each of the 8 tortillas with the apple salsa, chicken, tomatoes, onions, and cheddar. Serve with remaining salsa, black beans, or rice. This salsa sounds amazing and there are so many applications where it would work beautifully. Definitely! I’m thinking, just with a tortilla chip would be good. Or maybe apple chips! That apple salsa sounds delicious. I recently made a pear salsa and it was amazing. Can’t wait to try this apple salsa. Oooooh! I love pears. I’ll have to try that next.